Today is World Food Day, a day set aside by Food And Agriculture Organization of the United Nations to help focus on building a world without hunger. 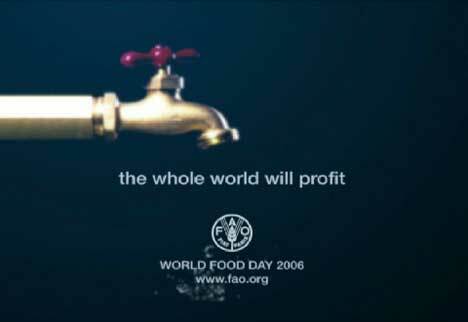 FAO commissioned a public service advertisement centering on the value of water in sustainable economies. The 30 second ad, produced by Roberto Laurenzi (Codesign), is available as a 5.16 mb mpeg video from the United Nations FAO video catalogue page, in Arabic, Chinese, English, French, Italian, and Spanish.